It's February! Or if you're on a "diet", FebruANY. Which really means, you've already failed your new years resolution of getting in shape this year. Fret not friends because Fitness Buddy is an app that'll jolt your bloated midsection to life. 1700 different workout exercises. 1000 workout videos. 4000 exercise photos. And sweat searing instructions for all of them. Fitness Buddy is an absolutely amazing tool to track your workouts, learn new workouts, build a workout routine and see your body's progress. For the smartphone inclined but weightlifting deficient, the preset workouts of Fitness Buddy can be adjusted to what equipment you have at your disposal. SO! There's really no excuse to not be able to work out. In addition, you could add your own personal workouts to the app so you can literally track everything you do. The best thing about Fitness Buddy is how organized it'll keep you with your workouts because your workout schedule can be listed in a calendar view for you to keep track of. 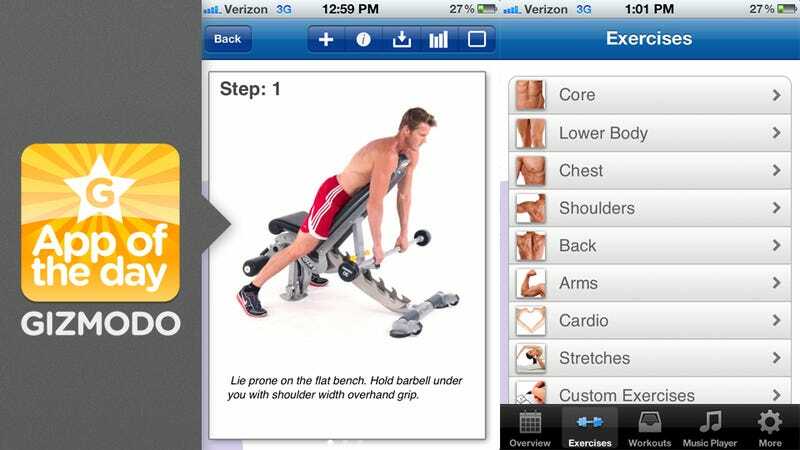 I personally like the ability to select specific muscle group exercises. But hey! What if you don't know the names of your muscles? That's fine as Fitness Buddy lets you select them from a picture of the human body. Also useful is the categorization of exercises (core, lower body, cardio, chest, etc.) and how they have exercises for all kinds of equipment (dumbbells, kettlebells, resistance bands, medicine ball, etc.) Fitness Buddy is so comprehensive that you can tailor a workout just for you.